I don’t know which I noticed first – the hair or the dress but both together are perfect. And the belt and even the sandals also echo the hair, si? Love your site. Thank you for all your work. i always dunno how to mix different prints together coz i hv a rule in my mind dat — print should be alwayz safe to match with sole colour! So cute. Pochahontas’ older sister? i love dresses. dresses are perfect. that’s all i have to say. She is so interesting looking and at the same time, like a beautiful doll. You’re right – perfect. … she knows all about being folcloristic and chic at the same time. 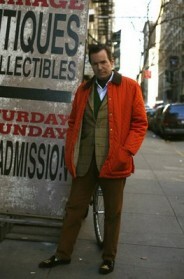 true sartorialist(a?)! 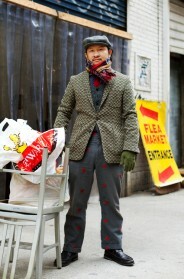 Is that flea market still around Sartorialist? What a wonderful surprise! I thought it had moved over to 17th street, visited, and found that it wasn’t the same. Can you say the location? Thanks! the original 26th St flea market is gone but several of the surrounding spaces are still going. This shot was taken on 26th btw 6th &7th at a Flea Market in a parking garage. I love that flea market on Ave. A too Sarto. One of my favorite Sunday visits on 11th St. Very sweet, happy face, like a souvenir doll! very nice! she looks like an indian women from a long time ago! I love the skirt and shirt because they are colorfull and have plenty of life! congratulations! Now this I like. European or American women who try to look to ethnical mostly ends up looking like a walking zoo, but she nails it. Feels effortless too. I love New York, the people are so interesting. Last time I went I was at the flea market in Hells Kitchen and had my camera out the whole time. Andy Warhol frequented the 26th Street Flea Market – talk about New York sightseeing!